We just wrapped up our first equal length stepped header for the BRZ, featuring mandrel bent T304 stainless construction and an optional high flow catalytic converter in the factory location for SCCA racing compliance. We're excited to take this and the next design or two we are working on to the dyno on Thursday. So far this is what we have got to show - the first prototype system is a Tri-Y design featuring 1.625" equal length (within 0.8%/.125") primaries and equal length (within 8%/.5") 1.750" secondaries into a 200 cell high flow catalytic converter with a 2.5" outlet to the over-pipe (will be fabricating a 2.5" overpipe also). There are two secondaries at the bend that is facing left, they are stacked on top of each other, and the higher of the two is not visible in the photo. This header does fit in the factory skidtray and ceramic coating will be an option. We have also discussed a faceted sheet metal heat shield. Our goal is to include our customers in our development process at every turn and we've got a fork in the road to determine which of the four other design ideas we should test first. So we'd like your input. According to our exhaust flow dynamics software the existing design is optimal with secondary runners being of a length that requires the removal of the catalytic converter. We were considering replicating this system exactly with long 1.75" secondaries in place of the catalytic converter. This would most likely require a jetted secondary oxygen sensor fooler to keep from throwing a check engine light. Alternately, we can build out a torque biasing design using 1.5" primary pipes and 1.625" secondary tubing with a high flow catalytic converter like the first design. The other alternatives are to run a long tube stepped 4-1 design with or without a catalytic converter but utilizing one of the above primary/secondary sizes, or going up in size (not looking terribly favorable from our preliminary calculations). So what would you like to see, we would love to have your feedback. All of the designs will probably get prototyped one way or the other. This is the first production header we will be offering and we'd like to gain as much development knowledge as possible from the process. Last edited by Jason@Nameless; 06-20-2012 at 04:27 AM. Wow FWIW that header looks nice. Since this will be a DD more than anything for me I'd prefer to keep the cat. Who makes the high flow you use btw? It's a Magnaflow. We use them in our Jaguar XKR downpipes, Jaguar S-TypeR, Jaguar XJR, Subaru WRX & STi Downpipes, Kia Optima/Hyundai Sonata Turbo Midpipe and have had zero field failures in 2.5 years. And Supercharged Jaguars eat factory catalytic converters for lunch. I'd be real wary of a non-catted header system right now I think. I say that because we don't have any tuning solutions, so the stock o2 sensors are expecting a cat of some sort. I'm no tuner so I don't know what that would do, but without the ability to properly adjust the ECU to account for cat-less, I'd stay with the cat. 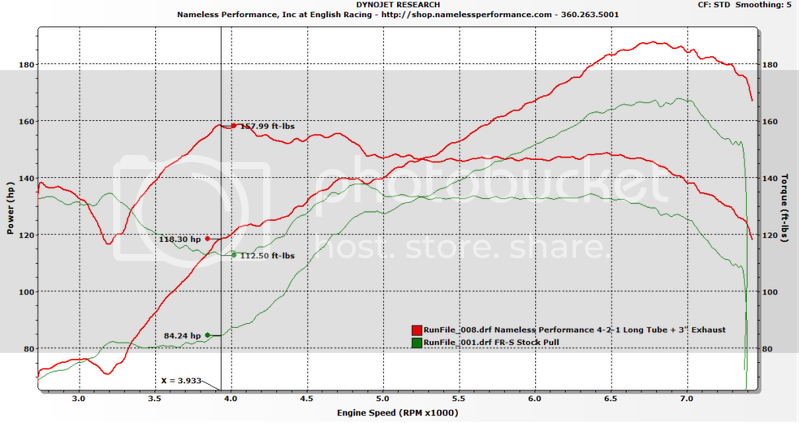 Maybe target a catless system for 4 months out or so, when ECU tuning is more prevalent. For now, my biggest concern is the heat soak. It's right next to that coolant line, and surrounds the oil pan. Doing some sort of a coating or wrap would probably help, but I'd love to see temperature data on the difference to know that a coating or wrap would be good enough to keep coolant/oil temps in check (and to keep that line from melting). Where does the 02 bung go? Will I melt my coolant line without coating this thing, or cause bad coolant temps? For a torque bias design with smaller diameter pipes, what would you think it would do, higher torque down low but less overall power? percentages or thoughts? excited to see dyno graphs. Cool I've never used a magnaflow one. Lots have had great experiences with renault high flows like HiTech uses. I've had horrible experience with junk like carsound high flow cats. Disclaimer: I have no subaru experience. However, headers on Hondas can be <1" from the oil pan and very close to AC lines and some coolant lines and it's never caused an issue there. Although I'm sure they can offer a model with a heatshield.. IMO it's just one more thing to break. Coating wouldn't be a bad idea. I don't like wraps myself.. Concerns on Catless: I'm not as worried about this as it seems you are. The primary O2 sensor is the critical sensor to provide closed loop feedback to the ECU for proper functionality of the fuel maps. That being said, there is a bit of a challenge in getting a good metering of all four runners should we choose a tri-y catless design. The secondary O2 sensor is, on almost all cars, only used for monitory catalyst efficiency and warm-up times. So really the challenge for us is to develop an secondary O2 sensor bung that will limit what that sensor sees so that the ECU doesn't throw a code for primary catalyst below efficiency or primary catalyst warmup. I've run catless on many turbocharged and naturally aspirated engines with no check engine lights if the secondary O2 sensor challenges are met. Heat concerns: This is a naturally aspirated car with very little backpressure in the primary catalytic converter. If it were a turbo car, I'd expect to see manifolds glowing white hot, but in this application I am not a bit concerned about proximity to the coolant line or the oil pan if some method of shielding is provided. As for melting the coolant hose, you'd have to work REAL hard to accomplish that. Even a small air gap in that are is going to provide enough thermal barrier to prevent that heat from reaching damaging levels. The good news is, we do have the ability to build faceted heat shields to selectively reduce the thermal transfer between critical components. We also have laser temp guns to monitor temperatures on the dyno. And we will be doing so. The other thing to note is that a two dimensional photo doesn't do justice to the distances that exist between these components. We did our best to keep the equal length while optimizing clearance for future development of heat shields as well as keeping this as clear as possible from the engine. Additionally, if you're worried about track oil temps, we have plans for a thermostatically controlled oil cooler as well - but I think your track driving behavior is going to be the oil temp modifier far more than the headers proximity to the oil pan. Again, all things we plan on monitoring and gathering data from in order to add components that are necessary for optimal design on the street and the track. As for the O2 sensor bungs, they are in the factory locations up top. Torque biasing header I think you would indeed sacrifice top end power, but it's really a testing question - if you gain 8 additional ft-lb of torque and lose 2hp at the top end, that's an easy selection to make. We could also do a triple stepped design, but again, that requires all of the real estate occupied by the header. More questions/thoughts!! Keep em comin'! <snip> I don't like wraps myself.. I agree with all of this. The header wraps work fine on T304, but they will accelerate degradation of the material. Remember, just because you alloy stainless with a pile of nickel and chromium doesn't mean you get rid of the iron and carbon. We've worked with the US Built Vibrant units (one of the only parts they have made in the USA) which are nice but extremely spendy, Magnaflow, Eastern Catalytic as well as the old Carsound brand. We have sold > 200 of these in 2.5 years with zero failures. And we back the products we incorporate into our systems. If you got a failure, we'd replace it. And it would probably drive us to investigate a change in manufacturer, but up till now we're very pleased with these spun metallic units. As far as flow designs - I would test the current design vs. the torque biasing.